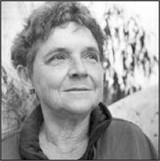 Adrienne Rich passed away on March 27, 2012 at the age of 82 and left behind a treasure of insightful writings on politics, feminism, and personal relationships to the radical times in which she lived. In celebration of her life, we share this intimate conversation from our archives. Helene Rosenbluth caught up with Adrienne Rich in San Francisco in 1995 while she was on tour with her book, "Dark Fields of the Republic". Adrienne Rich passed away on March 27, 2012 at the age of 82 and left behind a treasure of insightful writings on politics, feminism, and personal relationships to the radical times in which she lived. In celebration of her life, we share this intimate conversation from our archives. Helene Rosenbluth caught up with Adrienne Rich in San Francisco in1995 while she was on tour with her book, "Dark Fields of the Republic".